This is the first time I have ever completed our Christmas album on time.I usually finish them two months before the next Christmas (I finished 2009 in 2011, for example) or one month into the new year (I finished 2007 in January 2008, and that got me behind with 2008 memory keeping). Last year (2014), I finished our Christmas album three days after Christmas. Yep. Three days. And I actually worked on it for about 8 hours on a weekend, when my kids were taking a vacation in their grandparents’ house. 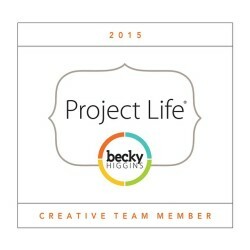 It was all because of the ProjectLife App. Seriously. It is that a-mazing. ..always begin with the end in mind. It all starts with the END in mind. Whenever I plan out albums or any scrapbooking project, I try to envision what I want it to be like after I’m done with it. I don’t necessarily know yet what I wanted it to look like but I knew that the album was going to stop on Christmas Day. Any holiday-related activities after that were going to our yearly Project Life album. 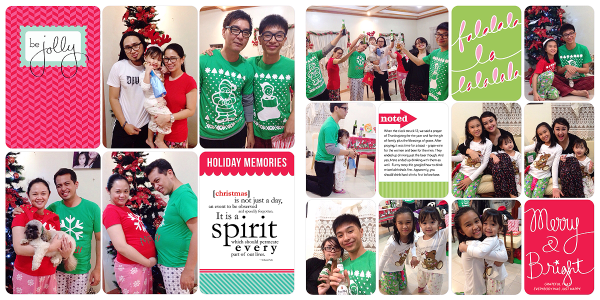 With the intention that I will be just focusing on Christmas memories for our album, I started picking snippets of our December activities related to the holidays. 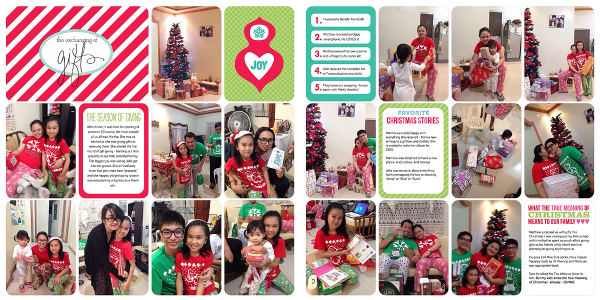 It was actually very simple: holiday preparations, holiday shopping, wrapping of gifts and our family’s focal activity for preparing for Christmas: the 9-day Simbang Gabi. 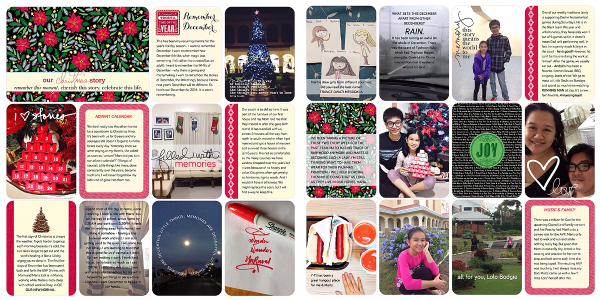 One thing I did differently was finish the layouts I made using the ProjectLife app in Photoshop to do my journaling. I am more comfortable typing in a big screen than on the phone (and I wanted a certain font – Caecila Lt Roman – not available on the iPhone). I also added some brushes and overlays to customize my pages. I also made the conscious decision to insert full-sized images in my spreads to balance out spreads which I think were busy with pictures. I reused my title page. 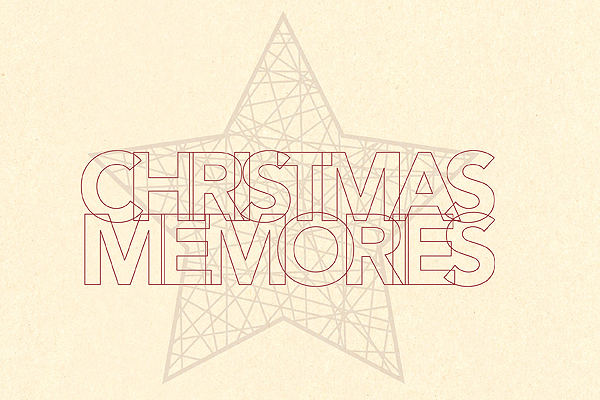 It has been the title page of our Christmas albums since 2009. I don’t think I will alter that anytime soon. It was my first time using bright colors in our Christmas album. I usually stick with my traditional reds and greens. But the Merry & Bright kit was just perfect for my Christmas Eve photos. I love it. What I love about doing the album immediately after the holiday festivities was the fact that the memories were still vivid in my mind. 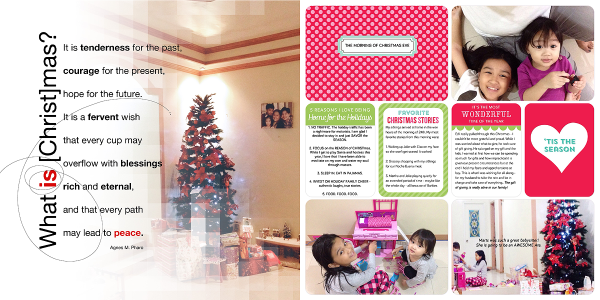 It was easier for me to write down stories – how my daughter shopped for gifts for her uncle and aunts, how she really was holiday spirit for us – determined to complete Simbang Gabi, the first time we hosted Christmas Eve dinner in our house, our pleasant surprise that our eldest shopped gifts for us. Those things. The little things. If you have any questions about my process or what materials/kits/brush I used in any of the pages, don’t hesitate to contact me or leave me a comment. I am still trying to make sharing of my creative process helpful (hopefully). 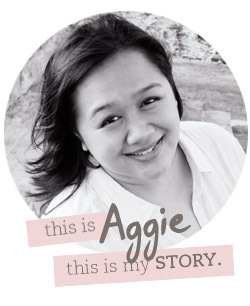 I am used to just chugging along and doing it – done, done, done (hehehe) – so if you want to a more detailed post, let me know and I will try to include your suggestions in my future scrapbooking/memory keeping posts.